About nine years ago as I was settling in as chair for the art department, I realized I wasn’t getting much done creatively. Other than a few freelance book cover designs, I was not producing at a level I wanted. My gouache technique was too time intensive for the time I had available. Fortunately, much of what I learned about this opaque watercolor (gouache) was easily transferable into transparent watercolor techniques. The best block of time I had available for creative effort was in class, so I set out o bring my watercolor technique up to speed (speed being the key). I wanted to be able to produce a finished artwork within a class period or two for the students to watch how to work with the techniques. I am now integrating in-class media demonstrations into my Illustration and Foundation Art classes and it does help students (or frustrates them) to see how the techniques are executed. 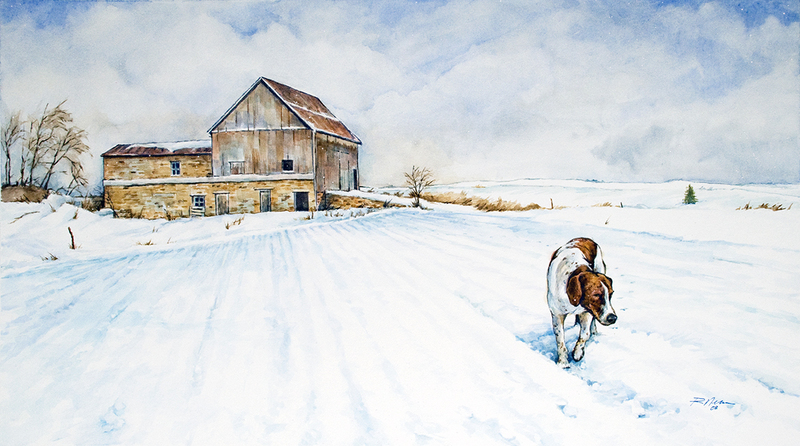 Working with traditional watercolor has also expanded the subject matter I now consider. Many of the images on this site are in-class media demonstrations – both gouache and watercolor.